SmartCal is a concept for a smart home agent that helps families to easily plan meals in order to gain more control over their lives. By doing so, SmartCal helps families enjoy meal time as a family, eat healthier and avoid wasting money on food. SmartCal knows about the dishes a family commonly prepares and provides a list of favorites to help when planning meals. Because plans often change at the last minute, it is flexible and provides suggestions for alternatives. A magnetic case allows it to be placed on the front of the refrigerator in order to build anticipation for upcoming meals. Using RFID sensors to know what food is on hand, it helps to families create a grocery list and is portable for easy travel. We did interviews and directed storytelling with 7 families to learn about their experiences and issues in the kitchen. We then synthesized our research findings into this conceptual model showing the food lifecycle. At each stage of the lifecycle we identified issues. We also realized that planning was an activity that played a part in every stage. We created storyboards for the most promising of our initial concepts. We then did concept validation sessions with families to see which of these ideas resonated with our audience. The idea of a meal calendar was the clear winner. 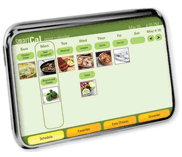 Several of the other concepts fit naturally with a meal calendar and became secondary functions of the device. We designed and iterated on a variety of screens to demonstrate the major functionality of the system. 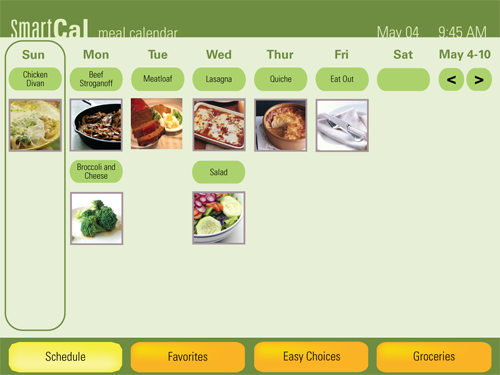 Below is the final version of the main screen displaying a calendar of the week's meals.